Sparse grayish/white fur. Can grow as long as 37” without the tail and weight up to 14 pounds. Have a pronounced snout, mouth lined with sharp teeth. Tail is furless, scaly and thin, prehensile to aid in climbing. Feet are also scaly. Adult size approximately the size of a house cat. Opossums are marsupials—females carry their young in an internal pouch. Gestation period is 12-14 days, and will remain in the mother’s pouch for 70-125 days, at which time they emerge and cling to their mother’s back. These animals are on their own when they are about 8-10 inches long (not including the tail.) If one is found smaller than 8-10 inches, it probably needs attention. Orphaned babies are often found looking for food near a dead mother, especially alongside roads. Prefer woody locales, particularly deciduous forests that seasonally shed their leaves. Commonly found near water source, but have become highly adaptable to urban areas. 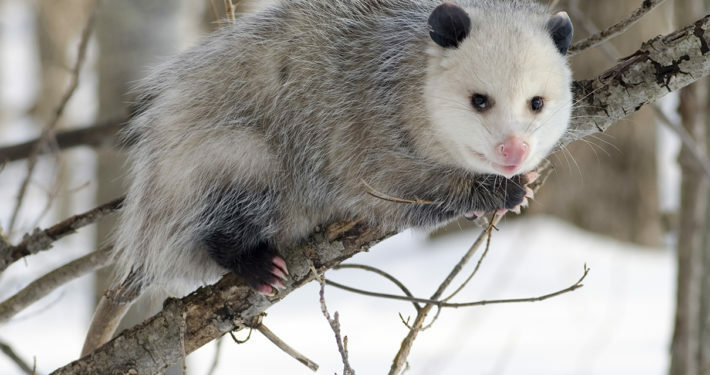 Opossums do not build their own shelters, instead, they take cover in dens and nests which are abandoned by other animals like skunks or foxes. 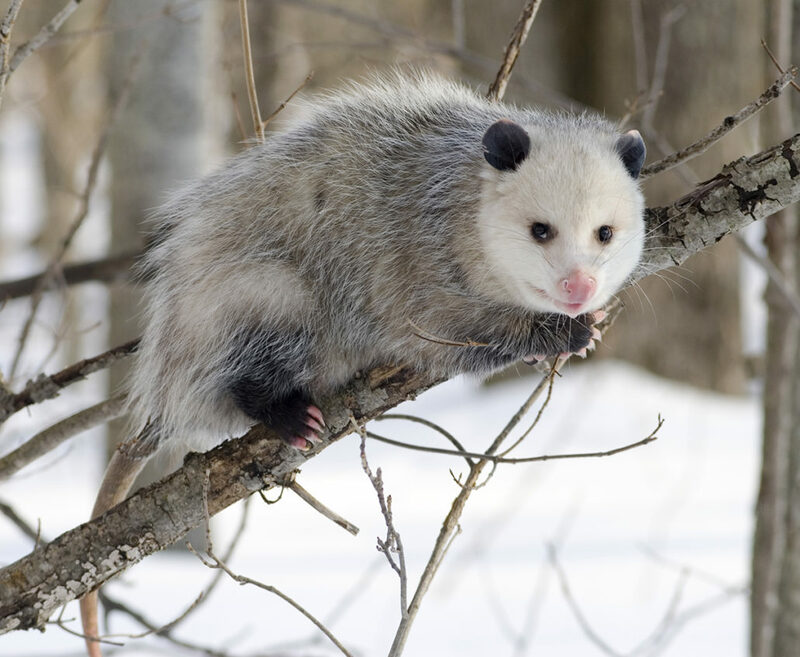 Opossums will also search and take cover in/under sheds, old buildings or attics, in the cavities within rocks, in brush piles, in hollow trees, or even fallen logs. When they find shelter, they will carry nesting material into it. They will stay in an area as long as a food and water are readily available, once the source is exhausted they will move on. Opossums are nocturnal scavengers foraging for food at night. They are opportunistic feeders and feed on a wide variety of items to survive: carrion, small animals, insects, reptiles, eggs, plants, pet food left available and garbage. When approached may start to drool excessively after a show of teeth as a defense mechanism—not disease related behavior. If cornered and prodded, pushed, etc. it will bite. Will not chase or provoke interaction with humans or pets. It will “play dead” to hopefully end the encounter. Leptospirosis (Well’s Disease) - transmitted through direct contact by open cuts and mucous membranes—possible but not prevalent. Rescue notes: injured mother opossums can be dangerous. As any hurt anImal is. Our advice is always to call a professional. Although not a rabies vector species you don’t want to take a chance. If you try to rescue attached babies you can do serious damage by pulling them off. If mother is dead, gloves should be worn, and if you are sure, then wrap her up, check for babies that may be dislodged or crawled out of her pouch at the site and immediately transport to a wildlife center or contact a rehabilitation professional. Critical to keep them warm as they cannot thermoregulate. You can use heated rice socks, drink bottles filled with very warm water. Absolutely no food or water. 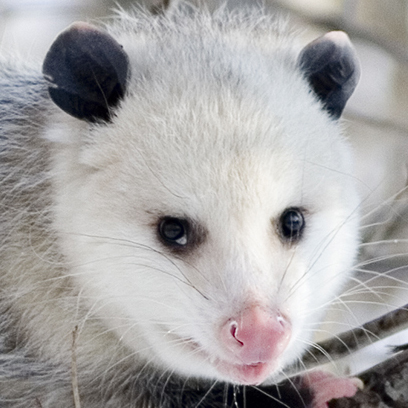 If guiding about disposal of a dead opossum—make sure it is truly dead and not playing so. Do not: bury, remove with pitchfork, dispose of in a dumpster or container they could not exit, if in fact they “come back to life.” Opossums cannot control when to “play dead,” it is brought on by an involuntary reaction triggered by stress. Part of “playing dead” is to emit a foul odor, i.e., the smell of a rotting corpse—so that might be helpful in determining whether it is alive or actually dead. If you find an opossum that appears to be injured, dying or dead, approach the animal with caution. Gently nudge the opossum a few times with your foot and observe carefully for any response. In the spring or summer, a female may have babies (joeys) in her pouch. Do not attempt to remove young from the pouch, as you can do serious damage to the infant’s throat and esophagus. Wrap the mother in a blanket and place her in a carrier. Do not use towels, as toenails tend to get tangled in the loose threads. Infants cannot regulate their body temperature. They quickly lose vital body heat on a dead or dying mother. The best chance for survival is to get mother and babies to a clinic or rehabilitator ASAP. If it is after hours and facilities are closed, call Friends of Cape Wildlife (508—375-3700. Always wear protective gloves and approach any animal to be rescued with extreme caution.